Tangled and True: nella designs. It's hard to remember life before Etsy. It has turned into my go-to for paper, jewelry, kids clothes and so much more. I am continually amazed at the talent that is out there, and the never ending "good finds". My latest, Nella Designs. It's no secret that I love paper. I'm obsessive about sending Thank You notes (I learned it from my mom), I always appreciate an "out of the ordinary" card in the mail, and try to send the same. There are so many I love from Nella Designs (you really should browse through them all), but I'm sold on these birds. Their simple design, long legs, the colors, and square shape. 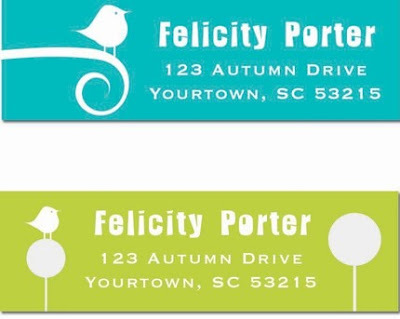 And while I'm in the mood for birds, these address labels are brilliant. I've never been an address label person. I have this weird love of writing them all out, but these are inspiring me to change my ways and fully convert to labels. Don't you agree? The paper goodness doesn't stop there, Nella designs has stationary, recipe cards, stickers and note pads. This week all Tangled and True readers will receive a free set of bird gift enclosures with every purchase. We're all about the birds today! Oh no, another etsy site to get obsessed over and to spend my money on!! I'm heading over there right now ... thanks for the heads up on all the best 'papery' treats out there! I'm on a bird kick too...love the labels...thanks for the etsy tip! I love that the address line is Felicity Porter. Another GREAT Etsy site!!! I'm addicted to browsing there, and I'm constantly having to try and force myself from buying every single wonderful thing I come across!!! 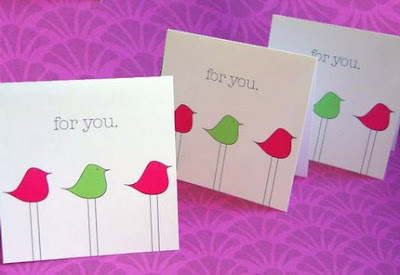 I'm seriously into anything birds lately, and these cards and labels are to die for!!!! I'm on my way over to check out the site. Thanks for sharing this resource with us! !